So... according to the analytics data from Ben Reilly Tribute... Ben has had a huge surge of popularity... in Germany. Not just one guy... its all over the country. Is Germany only now getting comics from 1996? No, we are up to date with comics (well, 2 or 3 months late for translation). 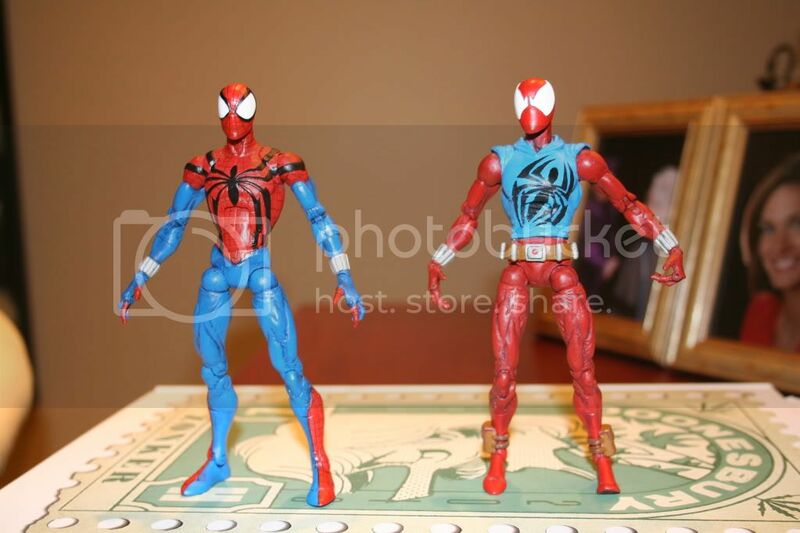 And actually I am fan of Ben Reilly since my first visit to the US in 1994. So, after 5 years, 1 month and 24 days, we've been relegated to a new thread. Folks, the fans of Reilly have officially managed to keep Ben alive on the Hype for as long as he was in exile! Congrats! Now, here's to another 5 years, 1 month and 24 days! Then why did neither Ben, Kaine, Jack or Gwen have one? Kaine was mortally wounded, gwen had dissapeared, jack had melted into a pile of goo and ben was too headstrong to be affected by the codeword. Wow, Thread Manager.... your toiling had not given me reason for blind rage until now. Well... the thread lives on. So enforcer did your copy of volume 5 arrive yet? Thread Manager is evil like the Master-Planner... lacking any charisma like the Master-Planner... and is probably keeping Seward Trainer's consciousness trapped in a looping program for God knows what reason. Yeah man... like three days after. I'm pretty psyched to read it. I'm 3/4ths through books 4.
yikes that price is insane. Glad you're enjoying the epic trades though. 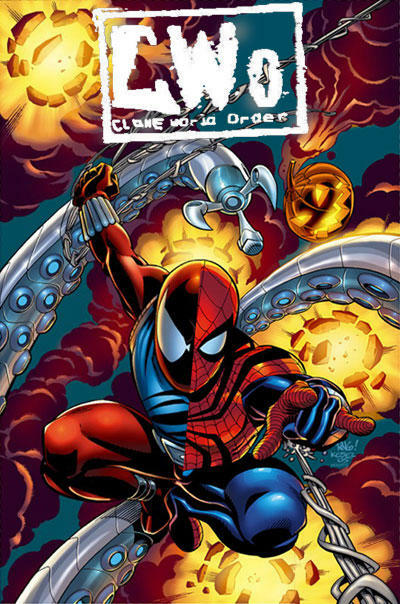 I'm personally holding off on reading a single volume until the entire clone saga has been released. It's taking an incredible ammount of restraint but I think I hang on. Seward was killed by Norman Osborn. That is EXACTLY what Thread-Manager wants you to think!! Because those were limited release variants, so people feel they can charge however much for them. Do yourselves a favor and just stick with the normal covers. I do have them... for some reason I just want those. But I may have to abandon that desire with THESE prices. Damn. Bought the Scarlet lead figure magazine today. Saw it on the shelf in a shop, and said what the hell. I've got a 12-inch Ben Costume Spidey that was based on the 5-inch super posable sculpt. He sits proudly in my office at work now. Occasionally I use him to drop kick my underlings. Yeah... work CAN be fun. My custom reilly spider-man was returned to me last monday after a few months of repairs and since its been back I've taken this figure everywhere with me. out to breakfast, on errands, into every room of the house (including the bathroom) and even on dog walks that figure is nestled into my pocket. I've always contimplated getting that 10" sensational spider-man figure (like you have) but never bought it because I never really bothered to collect a whole heck of a lot of figures in that scale. They take up too much space. Although it just occurred to me I have never seen pics of that figure out of the box. Could you snap a few photos of the figure tommorow when you're at work? I'd like to see what the whole figure looks like from 360 degrees. I've made some alterations to these figures in the months that I've owned them. I changed the color of the vest of the scarlet spider because the blue was just a tad too dark. I also changed the belt because the the capsules on the last belt were made out of a soft plastic and the paint would peel everytime the capsules twisted around. I also thinned the spider symbols on his vest. 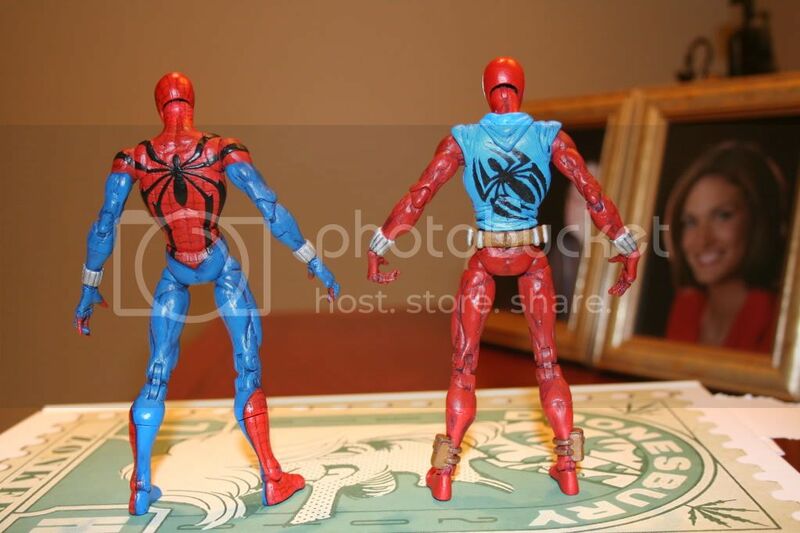 On the spider-ben figure, I changed the eye shape to make them more bagley-esque and then changed the lower outer legs on the spider symbols because originally the connected under his armpits. I made sure they were paralell with his spine.